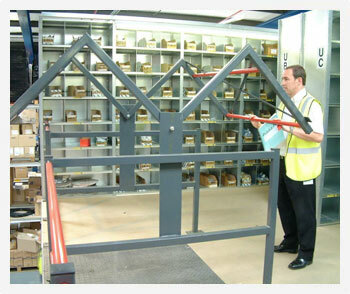 Here at Stodec Products, we can supply and install a full range of mezzanine flooring accessories, including mezzanine pallet gates, goods lifts and hoists, handrailing and barriers. All our accessories can be installed as part of a new installation, or to modify an existing structure as your requirements change. Every mezzanine installation we design will incorporate the accessories required to ensure that it is a safe structure, in line with building regulations. We can also install a range of accessories designed to increase the efficiency and flow of stock, such as scissor lifts, sliding or lift-out gates, and conveyor systems. For any more information about the range of accessories we have available, or to arrange a site survey to find out how we can help to modify your existing mezzanine structure to ensure convenience and efficiency, simply get in touch today. In all cases the item is designed to meet your particular loads and sizes. Contact our Design Team for advice and budget costings.